The attached photo shows how nice the Aero Pack engine retainer makes a rocket look. The CTI casings go so well with the Aero Pack retainers. Last Edit: 8 months 3 weeks ago by Frank DeAngelo. I got some designer masking tape from Michael's using 50% off coupons. I'm not sure how well the tape will stay on but I always have more of it. The Good Luck sticker was put on because Jonathan from RIMRA has one on his Leviathan. I plan on flying it at Berwick on August 4th. I have a F36 Smokey Sam and an F36 Blue Streak I can use. I have a 1 grain 29mm CTI casing on order or I can use the 3 grain casing I have with two spacers. I finally launched the Leviathan at the August 25th Berwick launch. All went well. I used an Estes branded F26-6 engine. At Saturday's launch in Amesbury the chute didn't come out. Either I used to much dog barf or the Aerotech F27 Redline engine has an anemic ejection charge. As a result, the upper body tube resembles as accordion. No problem a trip to the Estes web site can't fix. I NEVER glue the body tubes to the coupler. I put tape on the coupler at both ends and friction fit the tubes. Then I use decorative masking tape on the outside. I try to build rockets as modular as I can. That way when they break it is easier to repair. Last Edit: 7 months 3 days ago by Frank DeAngelo. At the September 15th launch the chute didn't come out and the upper body tube turned into an accordion. 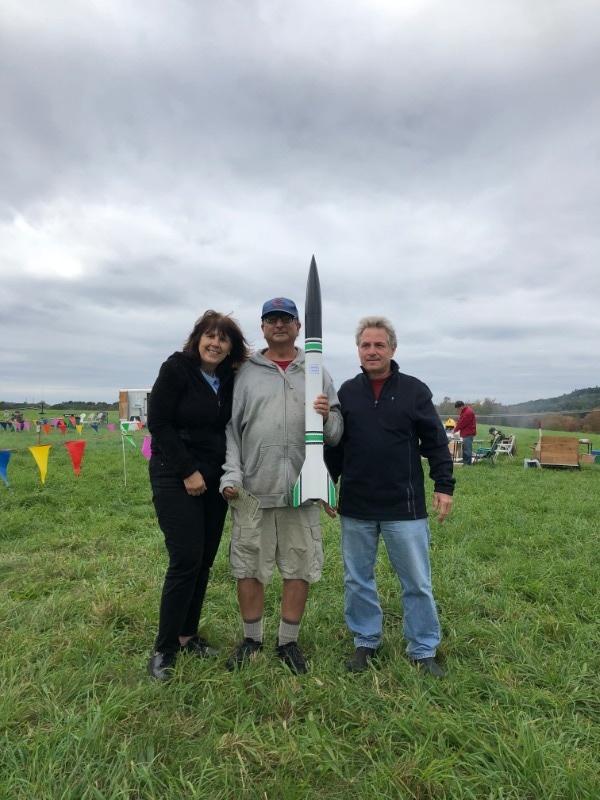 Two weeks later the rocket is fully repaired and ready to go. As easy as it was to repair the rocket, it still took some time to paint, install the rail button and apply the pin stripping. When I look at photos of the rocket before and after painting and stripping, there is a world of difference. I should call this topic "The Life and Times of the Leviathan." I hope to get a photo of Johnathan and myself holding our Leviathans. After all, he was the inspiration for building mine. In the mean time here is a photo of mine and my flight crew.